The new Stralis uses Cursor engines with in-line 6-cylinder architecture, high-pressure injectors and variable-geometry turbocharger. o 6 power variants (350 to 500 HP), with maximum torque of up to 2,300 Nm. The Cursor engines deliver maximum torque from low engine speeds, which remains constant over a wide operating range. The high degree of flexibility ensures a high level of driver comfort, excellent performance and low fuel consumption thanks to the need for fewer gear changes. The engines not only meet Euro 5 standards, but also the most stringent requirements of the EEV (Enhanced Environmentally-Friendly Vehicles) voluntary environmental standard. As well as meeting these limits, the SCR technology (Selective Catalytic Reduction using AdBlue additive) adopted by Iveco across its entire medium/heavy range also contributes to reducing running costs (with 5% lower fuel consumption). The system is lightweight and low-maintenance, and offers enhanced reliability. Unlike EGR, SCR does not involve gas recirculation in the combustion chamber. Iveco power-plants can be combined with 16-speed manual gearboxes (the latter with servoshift) or 12-speed EuroTronic automated gearboxes with the gear lever built into the dashboard. All the Cursor engines are equipped with the Iveco Turbo Brake decompression engine braking system, fully integrated with the main and auxiliary braking systems (Intarder). 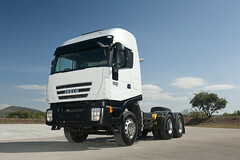 This means that the Stralis braking systems offer maximum safety combined with low running costs.